Sunday: Foggy, rainy. Highs in the 40s. Sunday Night: Rain ends. Lows in the 30s and 40s. Monday: Clearing out. Highs in the 30s and 40s. A Flood Watch remains in effect for southern Massachusetts and Rhode Island through this evening as 1-2 inches of rainfall is expected with some pockets of heavy downpours this afternoon. In total, the rains could bring nearly 3 inches over a 24-hour period, with flooding possible for low-lying areas. Parts of northern New England, including southern Vermont, central New Hampshire, and interior Maine are under a Winter Weather Advisory as a wintry mix is expected for those areas over the course of the afternoon. This advisory is in effect through 5 p.m., so use caution on area roadways for any of your Sunday travels in northern New England. As far as high temperatures today, by mid afternoon, temperatures are expected in the mid 40s for southern New England, but a spike in temperatures will occur later tonight as the rain continues to slide in along the frontal boundary. We could see temperatures flirting with 50 around midnight for SouthEast New England. For Northern New England, we’ll see high temperatures in the 30s to near 40°. 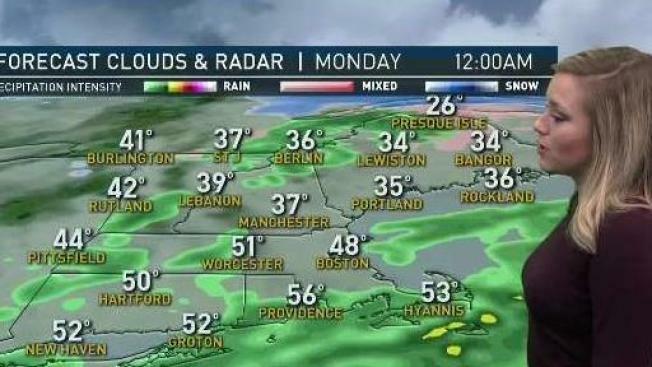 Rain exits just after midnight, as Monday morning allows temperatures to slide back to near 40 for southern New England, 30s north, under a mix of sun and clouds. The sunshine sticks around for the start of the work week, but as winds shift out of the northwest, high temperatures slide back into the upper 30s south, and upper 20s to the north. This minor cold hiccup will only last Tuesday as a warm-up returns Wednesday and Thursday. Valentine’s Day features high temperatures in the upper 40s for most under partly cloudy skies, with Thursday bringing a chance for scattered rain showers with highs near 50. After a mild 50 degree day, the weekend brings temperatures back into the 30s for most locations and just a slight chance for a shower late Friday into early Saturday.